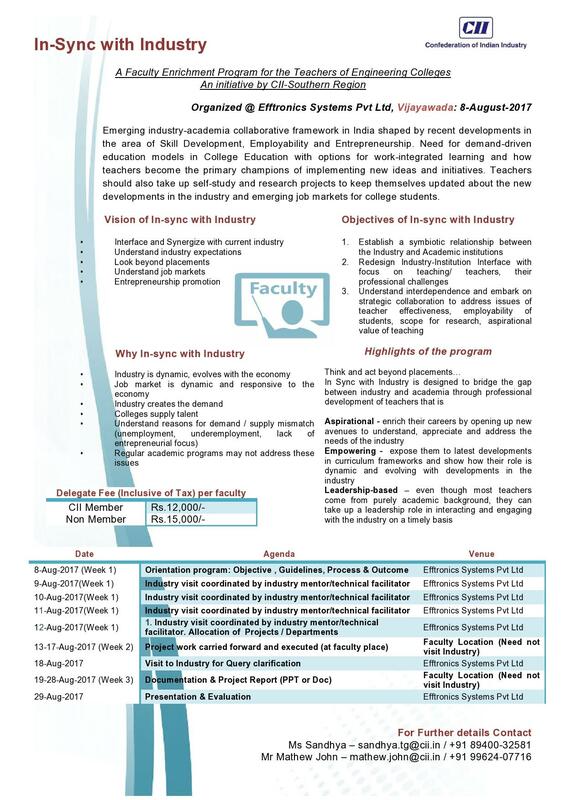 CII has come up with “In-Sync with Industry” an industry-integrated faculty development program for college teachers (Engineering) in the southern states of India. The main objective of this program is to equip the teachers with current industry knowledge and make them aware of the trends in their domain, research, innovation and most importantly job market and employment opportunities for their students. The focus would be on understanding and appreciating the knowledge, skills and practices from the manufacturing sector and related sub- sectors in the larger perspective of education and skill development. The program closes with certification from CII. The program will be organized at Efftronics Systems Pvt. Ltd, from 8th August 2017. “In-Sync with Industry” needs active participation from the academic community and industry experts. While we expect the colleges to nominate their teachers for the program, we also welcome their feedback on current faculty development programs. We invite participation from the industry (subject expertise and program facilitation) by sharing their knowledge and nominating mentors and guides during the entire program schedule. participants to possible topics for study and projects. This will be followed by discussion. in a focused manner and help them freeze on a topic of study with guidance on practical research. factory environment through planned visits and help teachers understand the process etc as applicable to their projects. Project Report /demo Writing and submission of Project Report, followed by presentation and demo.